I am very pleased to attend the fourth of the Industrial Cooperation Days in Defence and Aviation (ICDDA) organized by the OSSA Defence and Aviation Cluster under the auspices of the Presidency of Defence Industries. I believe that the ICDDA event provides major opportunities to find new markets, create business opportunities and build valuable business partnerships with major industry companies and SMEs operating in the military and civil defence, aerospace and space fields. In the international arena, the defence industry is one of the key factors that determines the economic and political power of countries. The defence industry is separated from other sectors as it is a strategic sector that directly relates to the defence of the country. It is not possible to speak of the independence of a country that is not self-sufficient to meet their own defence and security needs. In our country, this sector is much more important due to our geopolitical position. The defence and aerospace industry, which is an important part of industrialization and development, requires continuous change, innovation and modernization in parallel with global technological developments. Adoption of the development of a national defence industry that incorporates the private sector and is in line with technological innovations as a state policy in our country is critical for minimizing external dependence. With the high acceleration achieved by our defence and aviation/aerospace industry in recent years, we closely observe that it has started to meet the Turkish Armed Forces needs as well as to find a place in the international market where competition is fierce. Today, our defence industry is able to produce its own tank, helicopter, ship, unmanned aerial vehicle, and export these indigenous production platforms abroad. These positive developments in the sector show that our country has increased its domestic and national opportunities and capabilities and has turned them into economic value. A success story was achieved in the defence industry. The role of our universities, research institutions and organizations and SMEs in this story cannot be ignored. The turnover of the defence and aviation/aerospace industry reached US$ 6.6 billion as of 2017. Nearly 45 thousand people are employed in the sector, from engineers to technicians, from operators to unskilled workers. In 2017, the sector generated income at an amount of US$ 1.8 billion from foreign sales and received orders of US$ 8 billion. We see that the defence and aviation/aerospace industry, which achieved imports of US$ 1.5 billion, also allocated US$ 1.2 billion to develop products and technology. Speeding up its efforts in the defence industry in domestic and national terms, our country has reached a project volume of approximately US$ 45 billion in this field. As the Ankara Chamber of Industry, we are both very pleased and very proud of this point. Because Ankara which hosts about 80 percent of the defence industry and aviation/aerospace sector companies is also the capital of the defence industry. 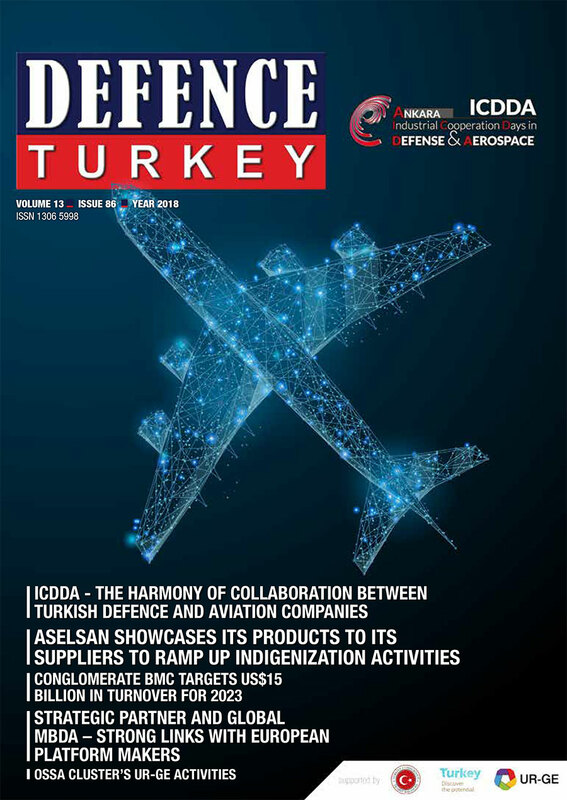 The headquarters of four major defence industry companies are located in Ankara, such as Aselsan, Turkish Aerospace, Roketsan and STM, which are listed among the top 100 of the largest defence industry companies in the world. Our defence industry is experiencing a golden age in our country which we have never seen before. Almost 80 percent of our defence industry was dependent on foreign countries in the early 2000s, and this rate has declined to 35 percent today. The indigenization ratio of the defence industry, which was around 20 percent in 2002 has reached 65 percent today. When the companies offering products and manufacturing services to the sector as a sub-industry are excluded, nearly 300 SMEs are operating in the defence industry. The OSTIM Defence and Aerospace Cluster OSSA, which was established by the joint action of Small and Medium Enterprises producing goods and services for the defence industry, assumes a very important responsibility. It has been successfully carrying out its activities on a wide scale from increasing the share of domestic production to making the defence industry SMEs competitive on the international market, and from the opening up of foreign markets with end products to technology transfer. 30 percent of total defence industry turnover is covered by the sub-industry, the majority of which are SMEs. Our defence industry has been able to produce its own satellite, unmanned aerial vehicle, training aircraft, helicopter, infantry rifle, combat ship, armored vehicle, missile and rocket systems. Especially in the last decade, the infrastructure activities for production with domestic technology were focused upon and given speed. Performing exports at an amount of US$ 2 billion, the sector has achieved exporting two-third of its production. Land platforms, civil aviation and air vehicles are at the top of the list of exported items on the basis of product groups. The 2023 vision of the sector which carries out activities in the defence industry are to be amongst the top 10 countries in the world market in exports and is set to proceed to the upper echelon and achieve an export target of US$ 25 billion in the defence and aviation/aerospace industry. Domestic technology and production will be improved by evaluating the leverage of public procurements via the Technology Development through Public Procurement and Domestic Production Priority Transformation Program. In this respect, the Industrial Cooperation Days in Defence and Aviation provides significant benefits. I believe the organization that brings together the global actors of the defence industry with our SMEs bring forth very fruitful results for our country, and I once again repeat my belief that success can be achieved in all fields with cooperation and the union of forces.